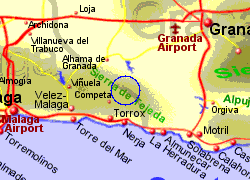 The Sierras de Tejeda, Almijara y Alhama Natural Park straddle the borders of Malaga and Granada provinces east of Malaga city, taking in much of the Axarquia area and north towards Alhama de Granada. 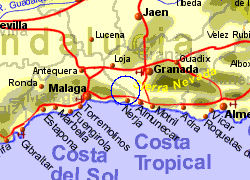 It includes some rugged limestone mountains with many caves (including the well known Nerja Caves and the Fajara Caves near Canillas de Aceituno), and the highest point in Malaga province, the Tejeda peak, at 2065m. 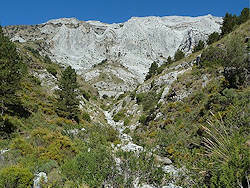 The limestone (and an important area of marble in the Sierra Almijara, gives the terrain a greyish white colour and erosion has resulted in some deep ravines with some fast flowing streams and waterfalls. The higher peaks are fairly devoid of vegetation but the lower slopes have pine, holm oak, cork oak, gall oak and box. The lowest slopes may be cultivated, with almonds, olives and grape vines being grown. The Sierra Tejeda has a natural yew forest which would have previously been large, and gives the mountain its name. Wildlife in the area includes mountain goats, ibex and red squirels, several species of eagles including golden eagles, plus many smaller species. The area is popular with climbers, walkers and bird watchers. 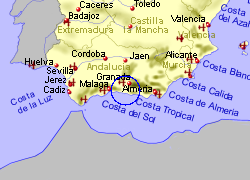 Map of the Sierras de Tejeda Almijara y Alhama area.